One teenager aged 15 came in with his father, he needed a filling and was a simple enough case dentally but I remember him because of the multiple scars on his arms and even on the side of his face. The translator said that such self-harm is common among teenagers, some adults too and that he had often to translate for doctors or in the hospital. One man had been in the camp for three years and was resorting to self-harm on a more frequent basis and in a more extreme way so as to risk rendering himself permanently impaired unless he agreed to an operation to rectify the effects of his most recent self-harm. We travelled to and from the camp by bus, the same bus that the refugees used as well as other volunteers. One morning on the bus we got talking to someone who turned out to be a GP from the Midlands who was volunteering with a small charity called MedGlobal that was providing doctors for the camp. Perhaps surprisingly the physical health problems encountered in the camp did not differ much from those in a deprived area of Derbyshire though the psychological trauma was, of course, on a different scale. Waiting for the bus back at the end of the day was memorable on one occasion due to the torrential rain, the lack of shelter and the fact that we’d forgotten to take with us that morning the umbrella that we’d so carefully included in our luggage when packing! These circumstances were exacerbated by the fact that a bus should have been come along every half hour and we were expecting to wait ten minutes but it didn’t turn up and so the wait was forty minutes. I must admit that had there been a taxi visible I’d have been sorely tempted to take it but there wasn’t, so eventually a very large and very wet group of people crowded onto the bus. 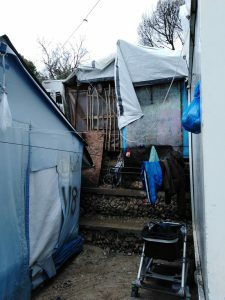 However, we were returning to a comfortable and dry room, we were not living in a crowded tent or portacabin and anyway we were only in Lesbos for a limited time so really we had nothing much to complain about. At the end of another working day we went to the camp entrance to catch the bus as usual. The wait should have been about ten minutes but we found great excitement and confusion with a mass of soldiers and policemen stopping the traffic, clearing the road, sending everyone off to wait in a different place and generally behaving in quite an officious manner. The situation was complicated by the fact that simultaneously there were large groups of refugees, many with quantities of luggage, waiting for coaches to take them on the first leg of their journey to Athens. I witnessed one group of people being herded and moved on in an unnecessarily aggressive way when there didn’t seem to be much wrong with where they had been in the first place. The majority just accepted it but one man drew himself up and said, “We are human beings, we are not animals” and the policeman slunk away. It’s an image that will stay with me for a long time. 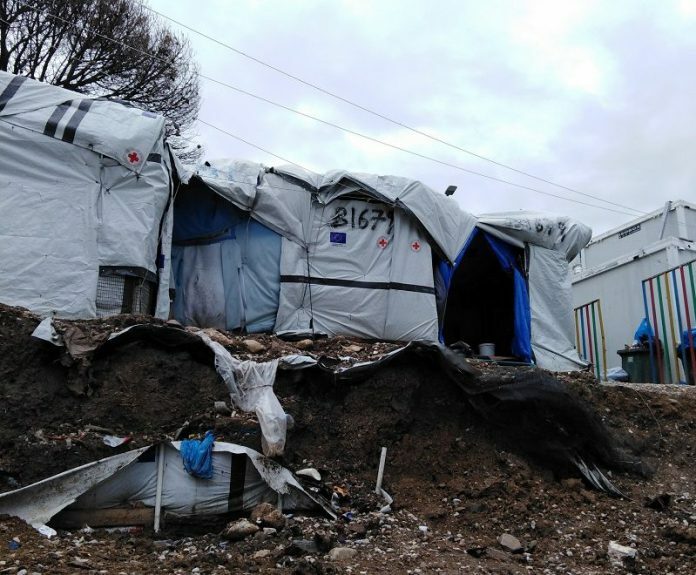 It turned out that all the fuss was because of the impending visit of the leader of the main opposition party, elections are due in the next few months and the issue of the camps and the refugees is a sensitive one. So a cavalcade of many limousines swept along but again a ten minute wait for a bus turned into a forty minute one though all other bus journeys were uneventful and on time. We were ably assisted by a team of translators and a coordinator who was a dentist from Aberdeen nearing the end of a three month volunteering stint. They were all lovely people, we’d met one translator when we’d been before who had begun to take on more of an organisational role as language skills and confidence increased. The team found things to laugh about despite the circumstances, there was great team spirit and camaraderie and it is part of what makes the experience worthwhile and has kept drawing me back. Next articleCarmen’s Kitchen, open for business.